February has always been known as the month of love, whether it be between couples, family or friends. To take the tradition of celebrating love ahead. 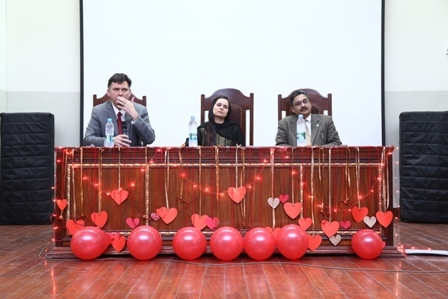 The Armacost Psychological Society arranged an event that has now become its trademark; The Psychology of Love, which took place on Friday 19 February 2016. 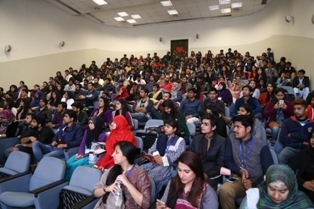 This year the panel of guest speakers consisted of Dr Imran Javed Ghauri,Clinical Psychologist and Consultant at Hajira Medical Complex; Capt Sobia Bhatti, Psychologist in Pakistan Army and Dr Ali Madeeh Hashmi, Psychiatrist, Department of Psychiatry and Behavioral Sciences, Mayo Hospital. The event began with a poetry recitation by Ms Mahnoor Zahid who shared Rumi’s insightful and beautiful words regarding this phenomenon. This was followed by the video showcase that presented the opinions of students, faculty members, staff and workers at FCC regarding love. Dr Imran Javed Ghauri shared his view on love regarding how it exists in every form and just about everywhere around each individual. 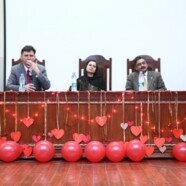 Capt Sobia Bhatti focused upon the theoretical background of love and how it has been viewed in the field of Psychology. She also emphasized over the different roles that each gender plays in order to promote love. Dr Ali Madeeh Hashmi provided the perspective of how love is present right from birth, in and around and individual and how it tends to shape up and change throughout the years, depending upon the different stages and roles that one encounters in life. The crowd was completely engrossed while listening to the pearls of wisdom that each speaker shared. Each speaker’s presentation was followed by a musical performance by Mr Moosa Eleazer and Mr Ahmad Aslam who won the hearts of the audience with their soulful performances. There was a Question/Answer session in the end which was a great opportunity for the audience to ask questions, give feedback and discuss their concerns. The session ended with immense appreciation for the quality discussions that were made by the speakers and the initiative that was taken by the APS council members for arranging this event.